There are seasons of our lives when blessings seem to be absent. Other times they feel sparse at best. We all long to feel and experience blessings in our lives. That old gospel hymn prompts us to “count our blessings” and “name them one by one.” However, the reality is that our human nature sometimes prevents us from remembering how blessed we really are. As we put one year to rest, it may be difficult to remember the blessings of this past year. Would you like to end this next year being fully aware of the blessings in your life? My parents continue to mentor me even though I no longer live under their roof. They recently introduced me to their “blessing jar.” It is a brilliant concept that results in being able to remember the blessings of the past year and be encouraged. It shows that your year has been full of blessings. Some years the health issues and other events can get you bogged down into the negative. This helps bring out the blessings and remind you of how God has blessed. Throughout the year, you deliberately make note of blessings as they happen. At the end of the year, set aside time to read through each piece of paper and remember the blessings of the past year. Take time to thank God for each of them. Get a large jar or container. Preferable the jar is clear so you can see it fill up throughout the year. Place your blessing jar in a visible location and keep it there all year long. Place a pen and a stack of 3×5 cards or paper pad next to the jar. Also consider carrying some in your brief case, book bag, purse, etc. As soon as possible after you experience a blessing, write it down. As soon as you are near your blessing jar, place the paper into the jar. Each blessing is written on its own card or piece of paper. At the end of the year, set aside an hour or so to read through each blessing. Bonus Tip: On discouraging days throughout the year, read a few of your blessings and be encouraged. Be sure to put the blessings back in the jar for the end of the year. a friend who comforts you through a tough time. You name it. These are your blessings. Record them and place them in your blessing jar. If you are like me, you are tempted to digitize your blessing jar. Technically (pun intended) this could work well. We could use a tool like Evernote, or we could even email each blessing to ourselves. However, there is something encouraging to visually see a physical jar fill up throughout the year. So, even if you use a tech tool to capture your blessings, I encourage you to print them out so you can put them into a physical blessing jar. Steve's passion is to help ministers and churches do ministry in our new digital, social, mobile world at the speed of life through building a strong ministry infrastructure (minfrasTructure). With a background in church administration, Christian education, missions, and technology, he offers advice, tips, and tools through writing, blogging, podcasting, speaking, online courses, consulting, and personal coaching. My wife and I decided to do this. It’s perfect timing to stumble upon this post. Thanks a lot Steve. Franklin, thank you for sharing. This is great. I know you and your wife will find encouragement and joy as you recognize the blessings in your life. 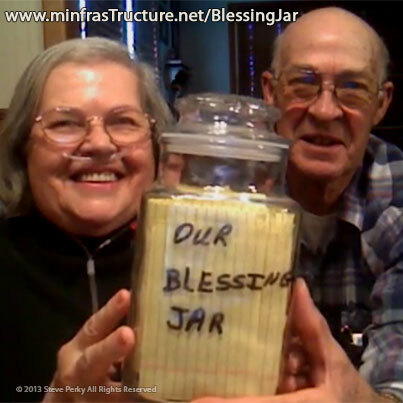 My wife and I are excited to open our blessing jar tomorrow. Making blessing jars will be one of our activities when I meet a group of women on the first Saturday of Feb. Thank you for this post! Myra, this is exciting. Thank you for the encouraging note. What Works Better: A Physical Church Office or a Virtual One?